I had absolutely zero interest in reading this book. It didn’t “fit” with my educational goals. It wasn’t “in my wheelhouse” so to speak. I have never wanted to be an administrator. There’s not a bone in my body that ever wants the pressure and stress that is put on administrators of public schools. (I say public because that’s all I know and I’m not going to assume to know anything about other schools.) Naturally it would make sense that a book called The Principled Principal would be the last educational book I’d pick up. This is a perfect example of why I wanted to do my personal challenge of #DBC50Summer in order of release date. Otherwise… let’s be real (see what I did there, Tara? )… I would have missed out on this gem because I would have never read it. In fact, the only reason I actually read it rather than “fibbing” was because I wanted to the fidelity of #DBC50Summer to remain intact. I want to be able to say that I have actually READ each of these Dave Burgess Consulting, Inc books. So I cracked open The Principled Principal (book 37) by Jeff Zoul and Anthony McConnell and was blown away by what I read. I value & respect my administrators very much; I have been blessed to work for exceptional principals and assistant principals. My first principal interviewed me THREE times before offering me the job. Made sense though – I was only 20 years old, fresh out of college with zero experience, and was not from the area. I wouldn’t have hired me. She was every breath of that school. I cannot say enough great things about her. When she retired, it didn’t matter who came in as principal because they didn’t stand a chance filling those shoes. Buddy the Elf could have become principal and served us hamburgers with syrup with all his contagious Christmas spirit and it still would have been a tough sell. I left that school midyear to begin my career as media coordinator. (You know that when a ‘singleton’ position opens up, you jump on it.) The principal that hired me for that job also took a huge risk with me. I had not yet finished my Master of Library Science and had (again) zero experience in the media center (nor with any grade level other than 5th grade – and 1st grade as my student teaching). She was moved to another school just 6 months after I started my job there. Then I began a phenomenal relationship with the new principal and we both were devastated when I was moved to middle school to pilot a new position for our district. She was happy for me, and I was excited for the challenge, but leaving her and our working relationship was heartbreaking. The principal I work for now is a forward thinker who is constantly pushing us to be our best for students. Best part (for me anyway)… she was an instructional coach. So she knows what my role is like and supports me at every opportunity & challenges me to see all points of view. I have worked for nine assistant principals in 13 years! Being friends with many of these administrators, I see the toll that running a school can take. I see the exhaustion and sacrifice that is made by administrators on a daily basis. I can confidently stand (errr… sit) here today and tell you that I have absolutely ZERO intention to ever become a building level principal. Others are gifted with that calling, so have at it. I respect you and look forward to working with you to help students and teachers in the building succeed. I will be your confidant, your sounding board (we all need one), and you never have to worry about me wanting to take your job (HAHAHA)! This book is powerful. I’m in a hurry to allow my principal to read it; not because she needs the principles for development, but because every page I read reminded me of her. I want her to see that what she’s doing is phenomenal and forward thinking. That she fits in perfectly with the 30 principals that share their story within these pages. I loved the 3-2-1 format at the end of each chapter. It reminded me of Teach 4, Lead 4, Learn 4 at the end of each chapter in Start. Right. Now. (co-authored by Todd Whitaker, Jeff Zoul, and Jimmy Casas). In 3-2-1, the authors share 3 stories from phenomenal principals (like North Carolina’s own Derek McCoy and Sean Gaillard – both friends of mine! ), 2 resources to check out that further your learning from the chapter, and 1 culture crusher that relates to the principle covered in the chapter. I’m not going to spoil the fun of the 10 Principles – get your own copy to find out what they are! Several (and I do mean a TON of) quotes stood out to me as I read. There are so many other quotes I could add, but let’s look at topics. I love the section where Jeff and Anthony talk about your school library being one of the places going out of date the most. Seems a bit ironic being that I work in a media center, doesn’t it? However, it’s totally true! Our media centers must either evolve or go the way of the dinosaur. I, for one, choose to evolve. The space in our school is student-owned, bright and cheerful, a space for collaboration, constantly filled with classes, and includes a tabletop game section, 8th grade puzzle (which has already become a tradition over the 3 years I have served there), minecraft lab (which will double as esports league computers coming soon), makerspace, virtual reality lab, flexible seating and tables on wheels, and I’ve recently transformed my office into a small group meeting space. Oh… and it has books. Lots of them. Notice that isn’t all it has though. It’s not a book warehouse, but a space for thinking, creating, collaborating, and brainstorming. Jeff and Anthony also encourage us to brainstorm five words that reflect my core values. This reminded me of my P is for Pirate by Dave & Shelley Burgess implementation in which I chose 5 words to describe my classroom (media center). My 5 core value words are empathy, responsibility, growth mindset, consistency, and drive. Neither of those are my implementation for The Principled Principal. My implementation comes from the disaster of a day (read that as week, please) that I’ve had. It’s chromebook season at the STEM magnet middle school that I serve. Do you know what that means? I am distributing 400(ish) chromebooks in a week, revisiting expectations with every child, discarding old/broken chromebooks and replacing with new-to-them chromebooks, which means the spreadsheet needs to change. It’s 123 new chromebooks for 6th grade that need to be “bagged and tagged”, teaching those students how to use Google Drive, create a WikiProject in our LMS, and understand policies behind acceptable use. It’s matching appropriate chromebook models with new students and brief troubleshooting when students can’t log on to our server. Y’all… this is a stressful time. I don’t typically ask for help, nor do I accept help when it’s offered. It usually takes more time to explain my convoluted process than to just do it myself. I’m also a bit of a perfectionist, so I go behind the other person anyway and double-check. (I know, I know… I need to let it go. But I just can’t.) If I’m going to issue a chromebook to a student and something happen where we have to charge the family for something, I want to be able to 110% vouch for the condition of the chromebook when it was placed in the student’s hands. You know the Snickers commercial tagline? “You’re not you when you’re hungry.” Well, I’m not me when it’s Chromebook season. I’m crabby, quick to argue, slow to listen, and generally just want to be left alone. Give me Pandora, my label-maker, my spreadsheet, and a scanner and let me do my thing. I have taken frustration out on more than one person this week. I have certainly not been a contributor to any resemblance of positive culture in the past 10 days. Today was the breaking point. As soon as the first 6th grade class came in for WikiProject training chatty and not listening to instructions, I lost my cool. It was ugly. It was only 9:15 this morning and I had already reached my boiling point. Now I know better. I know to project directions on the board. I know to set expectations from the very beginning. I know that the quieter I talk the quieter they will get. But nope… I yelled the directions (very quickly, might I add). I proceeded to show them that I was in charge of this space, so there (humph). And I did this class after class after class today. What in the world was I thinking? That’s not the way we operate in our media center. I don’t talk to students like that. I focus on building great relationships. By the time the 6th period class rolled around (I’m ashamed to say that it took me until 1:45) to get myself back together. As they entered, I was much more organized and my voice was calm. I praised students and we discussed common mistakes made throughout the day. I started off by letting them know I had been having a really rough day, being completely vulnerable in front of my students. I let them know up front that none of that was their fault, and that I was really working to get myself back together and find “happy Mrs. Ray” and invite her back to school. My implementation for this book comes from a mix of two principles. The People Principle and the Harmony Principle. I need to be the one with a calming effect, not the one who stirs the pot of negativity by adding my complaints. I need to remember that as an instructional coach, others feed off of my attitude. I’m not saying that I will fake it, because I think they need to see me struggle, too. There’s a camaraderie that is built through these struggles, but I also need to work on my actions meeting my words in my high-stress times at work. I was able to pull so much from this book that I was so hesitant to read. I am so thankful to have read it and certainly feel that if you are a school leader of any kind, not just “principal” you should grab a copy of this book for yourself! These principles are principles of exceptional leaders, not just exceptional principals. 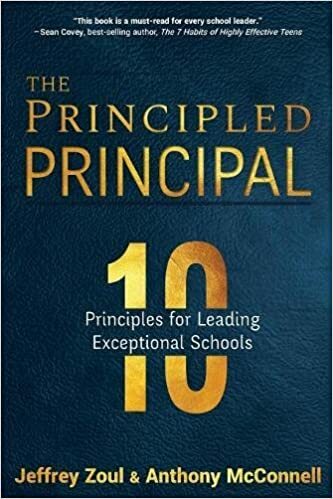 I really enjoyed The Principled Principal and look forward to sharing it with others. You should also follow along with the conversation on twitter using the hashtag #10Principles, as well as check out the website here! There are book study resources on the website, as well as my favorite video seen below. (So much truth!) You can also check out the individual author websites/blogs for Anthony McConnell and Jeff Zoul. For a preview of the book (whaaaat?!?! Right?! Dave Burgess Consulting, Inc has an updated website which allows you to preview every.single.DBC.book! For REAL! – I did it again, Tara! ), click here & scroll down to the very bottom of the page. But beware, you’re going to want to buy your own copy because starting it is like opening a can of Pringles. Finally… here are the very few tweets I managed to get out there. I’m trying to stay off social media as much as possible so I can get these last few books read and not be distracted. You will likely see less tweeting and #BookSnaps from here on out, simply because I’m running out of time. I have a deadline to meet (September 22 at 9:54 pm EST, but who’s counting). I refuse to let it go by without finishing #DBC50Summer! Flipgrid is available here! Thanks Andrea for an incredible idea and so blessed to copilot with you! Next up in #DBC50Summer is the final one (for now) from our favorite Google Guru (yes, I call you that all the time, Alice), Alice Keeler! She teamed up with the amazing Christine Pinto to share the message that even our youngest learners can use technology to showcase their learning! I love this, and so wish I’d had it when I was working at the elementary level! Check out Book 38 from the DBC, Inc powerhouse – Google Apps for Littles.